Add movement to every step. Printed with brilliant butterflies, a sheer, sleeveless, open-front layer floats over a soft, stretchy underlayer. 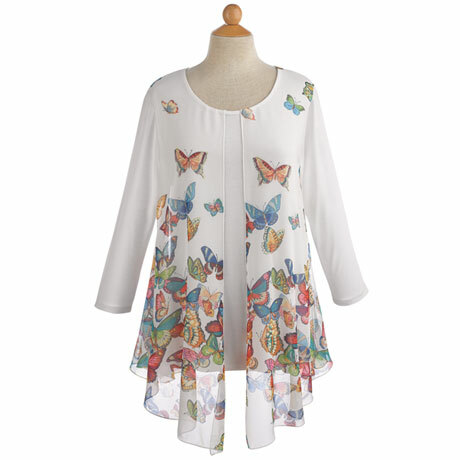 Tunic has ¾-length sleeves and a scoop neck. 100% polyester over viscosespandex blend. Underlayer hangs 26", overlayer 36" at longest point in front, 28" in back. Sizes S(4-6), M(8-10), L(12-14), XL(14-16). Machine wash. Imported.